One of the day trips we took out of Quito was to Hacienda El Porvenir, one of the three haciendas owned by Tierra del Volcan. 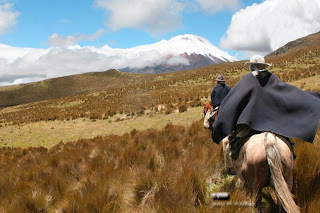 This trip took us south of Quito, to the flanks of Volcan Cotopaxi. Quito is located in a valley and is surrounded by volcanos. Within this chain, Cotopaxi is the tallest and is actually higher than Mt. Kilimanjaro by a few meters. A lot of popular day trips from Quito involve a drive to the volcano, parking, and then hiking in to the rangers' station. With the altitude and the constantly changing weather, we decided that trip was not for us. So instead we opted to let horses do the walking and booked a day trip to the hacienda. We were picked up on time and driven out to Hacienda El Porvenir. There we were welcomed into a comfortable, fireplace warmed room. With walls of adobe and woven blankets for decoration, it really did look like an old farmhouse, which is what it once had been. A tray of refreshments was brought to us. 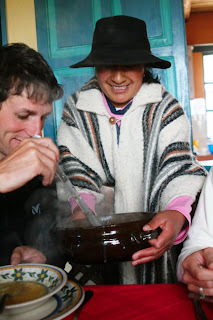 On the tray was tea and cakes and a small pitcher of the locally brewed VERY potent firewater that we could add to our tea. We took just a drop and WOW. Potent is right. Afterwards, we and our horses were prepared for our ride. 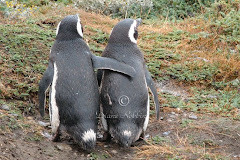 The slopes of the Andes are windy and cold. We were each given chaps and a poncho to wear. That was really an experience getting into (and later out of) those chaps. By the time we were appropriately bundled up, I wasn't sure I'd be able to climb up on a horse. Fortunately, they had a bench we could step onto to help us mount. The four of us headed out: me, my husband, our tour guide and our gaucho. What an experience. The wind was incredible, never stopping. The scenery was spectacular. Halfway through we stopped for refreshments which the gaucho had packed. What an experience. 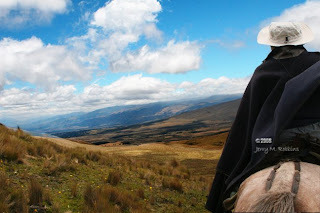 Riding in the Andes is like being on top of the world. We returned back to the hacienda after a 3 hour ride. I have to admit it turned out to be a bit longer than I expected and it was another adventure trying to get off the horses with tired, cramped legs. Fortunately there were a lot of young, strong men around to help us. Finally, after taking off the ponchos and chaps, stretching out a bit, then relaxing a bit, we were served a delicious lunch. And all too soon it was time to head back to Quito. Can I Blow My Own Horn?